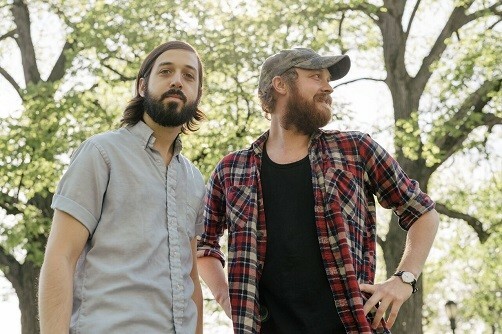 With an EP, Hoss released in 2016, and an upcoming album Heron - set for a release in September, the Brooklyn-based songwriters Jeffrey Silverstein et Justin Wilcox - going by the name of Nassau - have developed a quiet folk music, combining layers of jingling guitars and ambient textures, backed by a soft voice. Atmospheric and melancolic, their music could be a perfect bubble far from the busy life of the city. 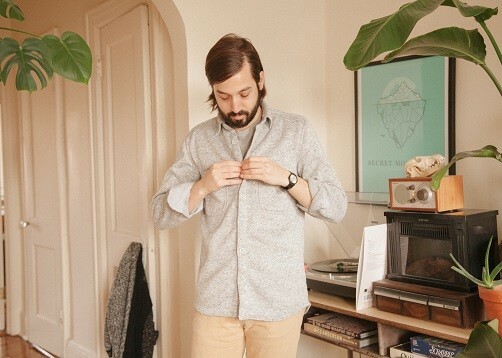 We've talked to Jeffrey about Brooklyn, and how they've worked on their album Heron. 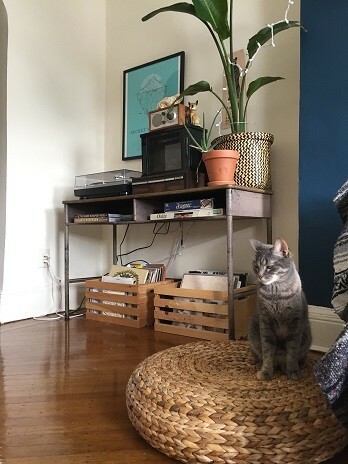 Currently, I live in an apartment in Brooklyn with Sunny - my fiance, and our two cats Vada and Willoughby. It’s the top floor of an old brownstone in Bed-Stuy. // Why & when did you move here ? Where are you from originally ? I’ve been living in Brooklyn for just about five years now. I’m originally from the suburbs of northern New Jersey. After graduating from Towson University, I stayed in Baltimore for a few years where I became immersed in the music scene, booking shows and performing in a psych band called Secret Mountains. Anytime we played Brooklyn, I always imagined what it would be like to live here. As time went on I was spending more and more of my free time in New York, visiting friends, family and Sunny. The band I was in was on its last legs and the three hour bus ride every other weekend was getting stale. It felt as though I accomplished what I wanted to in Baltimore and all signs were pointing this direction. I made the jump in the summer of 2012. // What do you especially like about the neighborhood you live in ? Bed-Stuy feels like home to me, whereas living in Greenpoint and Williamsburg never did. It’s a tight-knit community that we’ve been lucky enough to be a part of. People take pride in their homes, their block, and taking care of their neighbors. The victorian architecture alone makes it such a beautiful neighborhood to walk through - I find myself in awe of a different building, church, townhome, etc. almost weekly. Not to mention the community gardens, schools and parks. Small businesses here support one another, work together, and have diverse staffs. For the most part, there is an air of kindness and acceptance that takes precedent over the pompousness that I notice in other areas of Brooklyn and Manhattan. // What are your favorite places in Brooklyn ? What would you do if you have someone visiting you for 24h ? A stroll through Fort Greene Park would be a nice way to start. We’d grab breakfast from Brooklyn Kolache, then walk through the farmers market and watch the dogs during off leash hours. The park sits up high on a hill and has a west coast feel. On a nice day we’d cruise to the Brooklyn Botanical Garden, maybe pop into Covenhoven for a beer and a snack and then make our way to Greenpoint for some record shopping at Academy, Captured Tracks, and Record Grouch. Then rest for a minute in McGorlick Park. We’d have to do Paulie Gee’s for pizza and walk out onto the pier at Transmitter Park for the amazing view of Manhattan. If there’s a show happening at Baby’s All Right we’d finish things off there. // Brooklyn is changing a lot because of gentrification. a lot of music venues are closing down... How do you see the opportunities of making / recording / performing in Brooklyn these days ? I think in order to roll with the changes, you have to be willing to step outside your comfort zone and get creative. It is absolutely a bummer to see places like Shea Stadium, Palisades, Death By Audio, Glasslands, etc. close their doors but right now I believe people are craving unique music experiences that aren’t necessarily in standard venues.. Diverse bills are more important than ever. There are some incredible people booking shows in the city that are making sure lots of different voices are being heard and represented in DIY communities and beyond. It’s an immense period of change and learning, but I think people are asking themselves and others a lot of difficult questions, that’s a good thing! It is still an unbelievable city to connect with other musicians and learn from them. Having the opportunity to see such a wide range of music on any given night of the week is never something I try not to take for granted. // What would you like to see more in Brooklyn ? Less trash and waste. Sometimes even on the nicest day, in the nicest neighborhood, I still find myself avoiding trash tornadoes and stepping in/on/around it so often. It really puts this sort of film over everything here which is such a shame. It seems like such a tough battle to win/make a dent in with millions of people moving here each year, but it has been a consistent part of my experience here that is always frustrating. // You both are music journalists and music teacher. Do you remember how music came into your life ? What's your 1st ever music-related memory ? I will always remember listening to the Beatles greatest hits album, 1 (the red cover), in the car with my family on long road trips. It seemed like the one album we could all agree on and would sing along to. Music completely took over my life around 8th/9th grade. It was the point where I realized I had nearly zero interest in pursuing sports any more and got my first electric guitar. A lot of my friends were going through the same shift so starting bands, learning tabs to Green Day and Blink 182 was it for me. In college I spent so many hours at Barnes & Noble and the local library reading music magazines and requesting albums to borrow. That’s when I really got into songwriting of my own. The obsession never quit. At this point I’ve been involved in music on so many levels, managing artists, music journalism, working at venues and performing in bands. I am grateful for everything music has brought me - friends, travel, support systems and so much more. // You released a 1st EP in 2015 and your 1st album will be out in a few months. Can you tell us more about what to expect ? And can you describe your process of composition ? Hoss, our first EP for Fire Talk saw Justin and I collaborating for the first time - figuring out our strengths and weaknesses as songwriters. It was our first go at releasing music in quite some time. The follow up, this year’s Heron is a step forward both sonically and thematically. Justin is also a great composer and his ear for production has grown so much in a short amount of time which gives the whole record a more full-bodied sound. I think we’ve learned how to use our limitations as a duo to our advantage. In regards to composition, it’s begun to take different forms but usually one of us will have a riff or melody and we work together to expand the ideas or re-work them completely. We’ll wind up having 3-5 demo versions of a song before we are set on the structure. From there we’ll ask each other, what is this song all about? What colors do you imagine? What is happening here? That helps us with adding drums, ambient textures, etc. until we’ve accomplished the mood we want. It’s easy to get carried away as a duo making home recordings with adding layer upon layer, so we try to keep things as organic as possible. // Your music is soft and mellow. I'd picture it more in a rural landscape rather than in an urban one. Does the environment inspire you or have influence on your music ? Other people have said the same and we dig it. It’s hard to be certain if city life effects our music. I’d like to think that Justin having grown up in Tennessee and me in New Jersey has made for an interesting mix. We definitely did not grow up listening to the same type of music so it’s always exciting to see where our musical paths intertwine. As this project progresses, I keep saying the music sounds representative of where we are at in our lives and our personalities. We’re happy to be making music that we’d want to listen to. That feels great to be able to say. // What do you like the most about your home ? 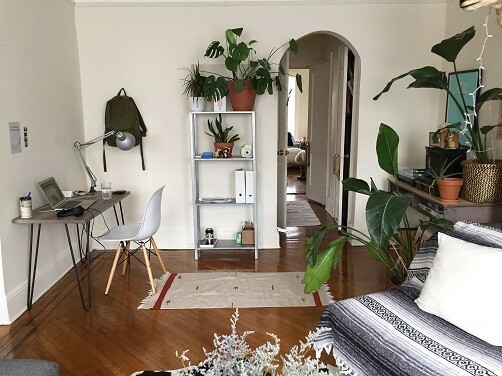 What are your favorite pieces of furniture or rooms ? 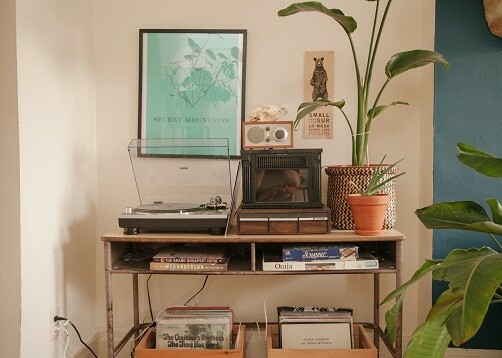 Oh man - I love our old school desk that has become our record player stand, etc. in our living room. I’m also a huge fan of our arched doorways that lead from kitchen to living room, living room to bedroom. I’d be a fool to not mention our mid-century dresser - love that thing and got such a deal for it. Someone was moving out and just needed it gone quick. Sunny is really to thank for making it so cozy in here with the blankets, rugs, plants, taxidermy ,etc. // What songs make you feel home ? // If you could live anywhere else in the world, where would it be ?